This weekend was the first weekend that I managed to venture into my garden. And, as I write, the sun is still shining and it is past 5pm - which makes more than a pleasant change. I love this time of year, as it marks the end of winter (and let's face it, it's been a long and cold one) and ushers in spring. The arrival of spring of course also heralds the arrival of Easter, and this Easter the BBC has an array of programmes across television and radio - from live worship to challenging documentaries - to both mark and celebrate its significance. I am really proud of our Easter content - it really has got something for everyone. Highlights, as always, are too numerous to mention in detail here but I just wanted to talk about a few that I really hope you will be able to find the time to watch and listen to. For Holy Week in Does Christianity Have A Future? Ann Widdecombe investigates the changing face of Christianity in the UK, with some fascinating results. 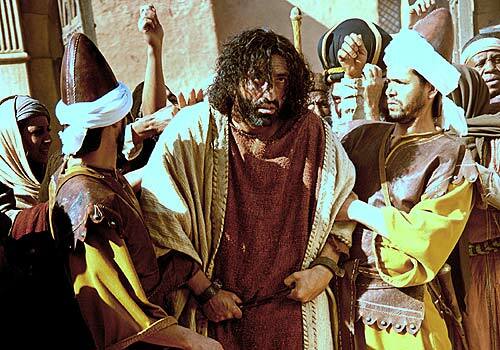 And, in The Jesus Story, the life and teachings of Jesus are explored in a two-part series, featuring dramatic recreation of key moments of the Gospels, coupled with expert examination of the latest archaeological, historical and theological research. Both Does Christianity Have a Future? and The Jesus Story will be shown on BBC One. We will also broadcast live from Westminster Abbey The Royal Maundy Service (BBC One, Thursday 21 April). Presented by Huw Edwards, the service coincides with Her Majesty Queen Elizabeth II's 85th Birthday, the first time this has happened during her reign. And don't miss BBC Radio 4's Thought For The Day on Maundy Thursday with The Archbishop Of Canterbury, the Most Rev Dr Rowan Williams. For Good Friday on BBC One Bettany Hughes asks What Is The Point In Forgiveness? Embarking on a fascinating journey through 2,000 years of our history, she tries to find out if the concept of forgiveness has actually benefitted mankind. Also on Good Friday on BBC Radio 2, Aled Jones presents At The Foot Of The Cross. St Albans Cathedral is the glorious setting for meditation in words and music for Good Friday. Music, poetry and readings from the Bible read by Hugh Bonneville and Emma Fielding tell the story of the crucifixion with, at its centre, a complete performance of FaurÃ©'s Requiem . And I'm delighted Easter From Kings makes a welcome return to BBC Two on Easter Eve, with music from Handel's Messiah and Mozart's Ave Verum Corpus being sung by the world-famous Chapel Choir. Full details of all the Religion and Ethics programmes on BBC TV and Radio over Easter. I hope you have a great Easter - and if you do find the time to watch and listen to some of our programmes, that you enjoy them!